In this post I’ll show you how to use Salon Booking System plugin to manage booking for your classes. 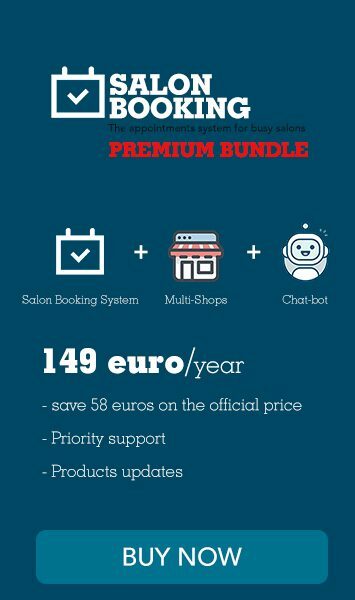 Since the 3.22 version Salon Booking System plugin has a new option that allows your assistants to be booked more times for the same date/time slot. This means that our appointment system can be used for teachers and school managers that offer tuitions to multiple customers during the same session. Let’s make an example on how to correctly set-up Salon Booking System plugin for your “Dance school”. Every classes is taken by a different assistant, in this case we will talk about “teachers”. Each classes can be attended by a maximum of 10 students and the classes are taken every day. Then set “customers per sessions” to “30”. Why? You need to sum up 10 + 10 + 10 ( the maximum number of students for each class). Create three services, each one for a different class and set the option “Unit per hour” to “10” ( maximum number of students per session). Create three assistants and for each of them associate the correspondent service ( class ). Then enable the “multiple bookings” option. Now the booking system is ready to receive tons of reservations for your great dance school. Did you get any problems using this settings? Get back to us, we’ll be happy to help you out.